It was a Wednesday night and I had no plans. “A night all to myself with no where to be!” I thought gleefully. But when I came home to an empty house and a few meager plastic containers of cold pasta, my delight turned to despair. I texted a few friends but everyone was busy. All dressed up with no place to go! 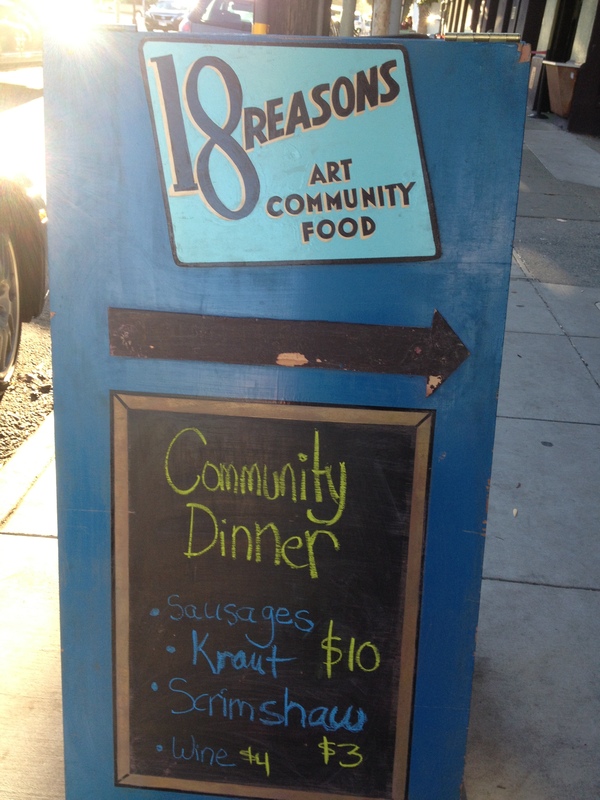 But then I remembered reading about a Community Dinner at 18 Reasons. Based in the San Francisco Mission across the street from the Bi-Rite Market, 18 Reasons is a community cooking school and so much more. Each month they offer a $10 community dinner featuring local producers. On the menu that night were Fatted Calf sausages and homemade sauerkraut made by 18 Reason’s Executive Director, Sarah Nelson. I arrived to find about forty happy eaters seated together at long wood tables– from Mission hipsters to families with kids. Whether you are passionate about cooking, sharing a meal with friends, or learning about the food system, 18 Reasons has something for everyone. Their motto is “empowering your discovery of good food” which is exactly what they do through gamut of events and classes that engage eaters, drinkers, cookers and crafters across the good food spectrum. Some of the most popular classes include a Basic Knife Skills (sells out every month!) and classes on the exotic (Flavors of Azerbaijan) to the fundamental (Whole Grain Primer) all taught by Chef Michelle McKenzie. Their film and lecture series includes both fun and serious food topics, from a screening of Babette’s Feast to a discussion of what it takes to be a farmer. They also reach over 2,000 low-income families each year through their Cooking Matters program, a cooking and nutrition course that teaches adults, kids, and teens how to plan, shop for, and prepare delicious, healthy meals on a limited budget. Volunteer chefs and nutritionists contribute thousands of hours each year to the program, which is offered at partner sites throughout the Bay Area. Check out their full calendar and their schedule of Cooking Matters classes. Through eating good food together, we discover our community. 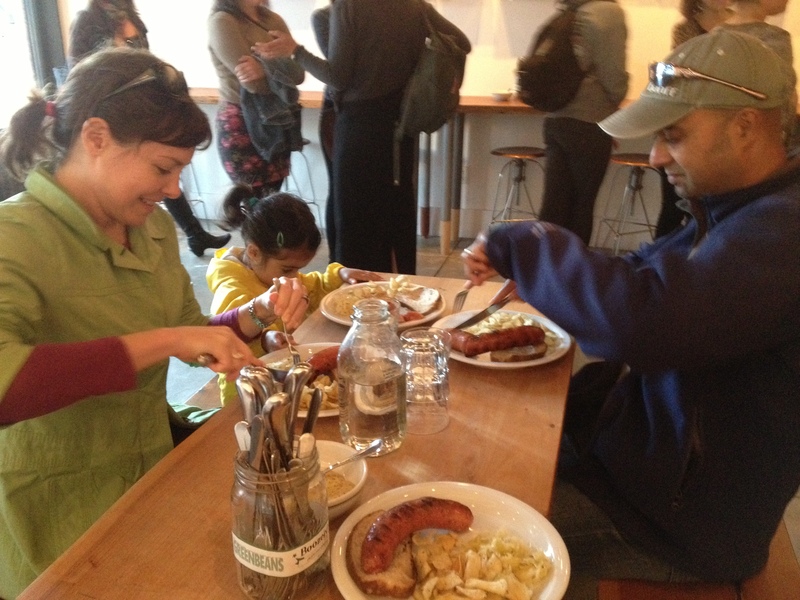 Our sausage and sauerkraut dinner felt like a big family feast with a bunch of long lost relatives. 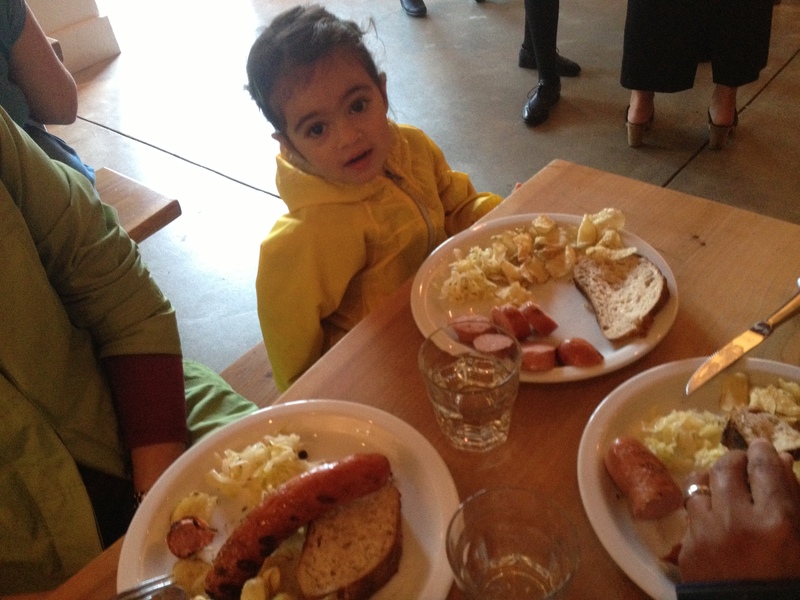 Of course the food was delicious, but even more so was the little girl who sat next to me. Now when I have a free night, I’ll know where I’m welcome: The next community dinner is on Wednesday, Jan. 29. The menu: Buttermilk Waffles, Benton’s Bacon, with Bourbon Barrel Matured Maple Syrup. Hope to see you there!